The Cumberland & Dumfriesshire Farmers Mart P.L.C. 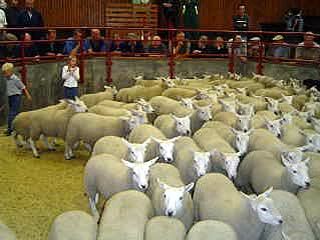 had forward 1,003 Breeding Sheep and 2,606 Store Lambs at their weekly sale at Longtown on Tuesday 17th August 2010. The Special August Fair of Breeding Ewes attracted a large company, trade was extreme with most ewes up £25 on the year. Top price of £145 for Texel cross ewe lambs from Crumhaugh Hill who also sold others at £100 with The Flex to £93. Shearlings to £123 for Texel crosses from Uppercleugh; Suffolk £118 Newington; Greyface £118 Newington. Ewes sold to £101 for 3 crop Greyfaces from Nunscleugh, others £100 Englishtown; Suffolk £98 Linton House; Charollais £95 Linton House; Texel £87 Linton House. Included in the sale was Blackface ewes from Corehead with 1 crop to £64, 2 crop £64 and 3 crop at £64, overall average £62.50. Suffolk shearling rams to £230 Riddings Hill. Texel ram lambs to £82 Demesne. Store lambs were again dearer for a good show, more buyers than ever present. Top of £68.50 for Beltex’s from Greenknowe, others £60 Winterhope; Texel £62.50 Dolphinston and Timpendean, £62 Carlenrigg; Greyface £61 Parsonshield and Whintingstown, £59.20 Parsonshield, £58.50 The Row and Hole of Lyne; Suffolk £60.20 Glendhu, £59.80 Haswellsykes; North Hill Cheviot £54 Hownam Grange; Blackface £53 Penpeugh; Masham £52 Jury Park.